Physiotherapy helps restore movement and function when someone is affected by injury, illness or disability. Physiotherapists help people affected by injury, illness or disability through movement and exercise, manual therapy, education and advice. They maintain health for people of all ages, helping patients to manage pain and prevent disease. The profession helps to encourage development and facilitate recovery, enabling people to stay in work while helping them to remain independent for as long as possible. The title "Chartered Physiotherapist" and the initials MCSP indicate that a physiotherapist is Health Professions Council (HPC) registered and a member of the Chartered Society of Physiotherapy (CSP). A professional, scientific approach to the assessment, diagnosis and treatment of your complaint, who has qualified with a University degree and who is committed to continuing education and research. Physiotherapists use therapeutic exercises designed to strengthen the affected body area. They need to be repeated regularly, usually daily, for a set number of weeks. As well as specific exercises, gentle activities such as walking or swimming may be recommended if you are recovering from an operation or sports injury that affects your mobility. For someone with a mobility problem caused by a condition such as a stroke, a physiotherapist may suggest doing exercise that targets the affected area of the body. There is evidence to show manual therapy is beneficial in treating some types of musculoskeletal conditions, such as long-term back pain (where the pain lasts for longer than six weeks). Hydrotherapy patients receive individual attention and are given individually tailored programs and are accompanied in the pool by a physiotherapist at all times. 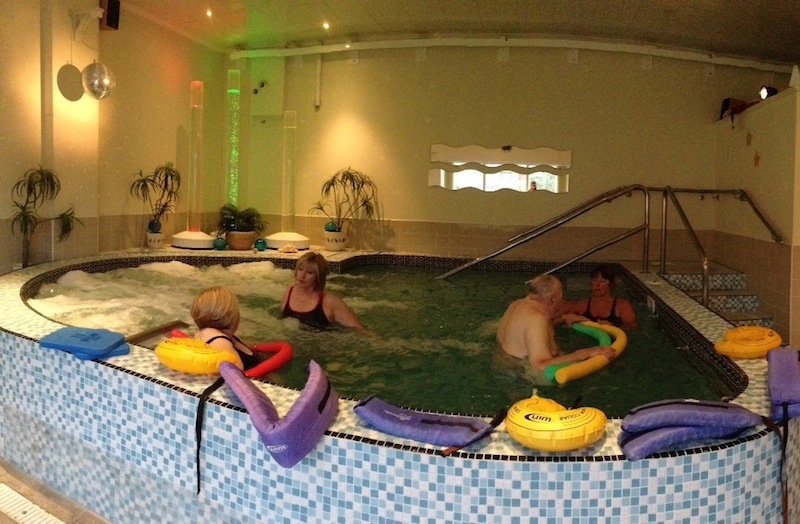 Our therapists have extensive experience in hydrotherapy. All sessions take place in a modern purpose built pool. What is hydrotherapy, how does it differ from swimming? Hydrotherapy is the use of water in treatment of a range of conditions, including arthritis and other musculoskeletal disorders. Hydrotherapy differs from swimming because it involves special exercises which take place in a warm-water pool. The water temperature is set to 37°C, which is warmer than normal swimming pools. 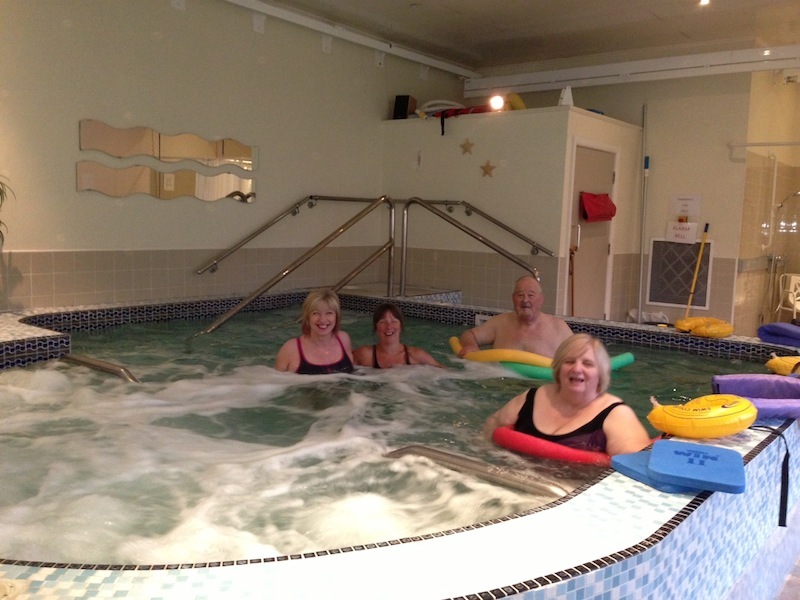 What are the benefits of hydrotherapy? 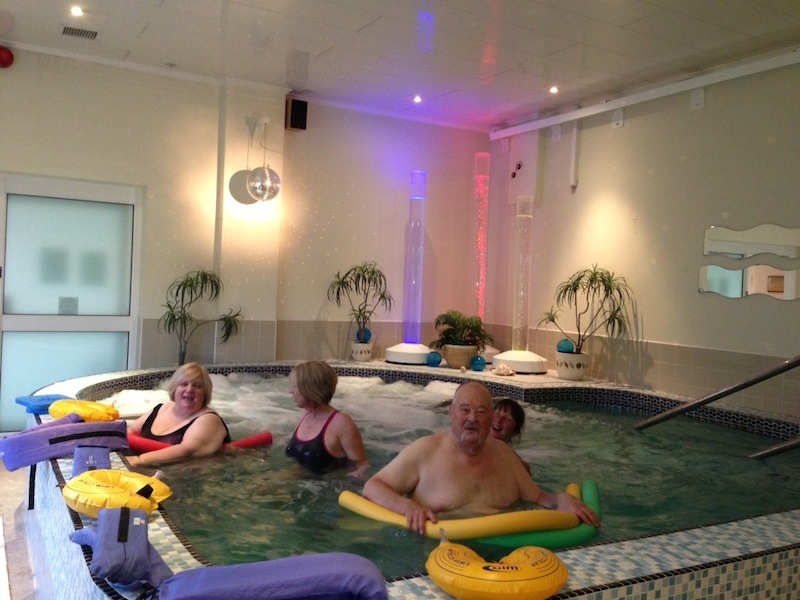 Usually people who have arthritis in several joints find most benefit from hydrotherapy. This is because all the joints can be exercised easily in the warm supportive water. Hydrotherapy also helps people who feel pain when walking, since the water provides extra support. Hydrotherapy is sometimes used after joint replacement surgery and people with back or ankylosing spondylitis and stable neurological patients. Acupuncture may be offered to you as part of your rehabilitation and pain management programme. Acupuncture is one number of different types of treatment that the physiotherapist can offer and there is good evidence of its effectiveness. Often a physiotherapist will use acupuncture alongside treatments such as exercise, joint mobilisation and general rehabilitation. Recent research is now supporting the effectiveness of acupuncture, particularly in the management of pain, suggesting that it is effective in the treatment of low back pain, neck pain and knee osteoarthritis. Our Physiotherapists use Acupuncture to help with pain management and other conditions such as fertility problems. Your acupuncturist will use sterile, single use needles. The needles are fine (a lot finer than an injection needle) and they are inserted quickly through the skin and into the tissues. Acupuncture needling should not be painful although some people do experience a pinprick or scratch like sensation. Research suggests that for a longstanding condition such as lower back pain, a course of 6 - 10 treatments is required to achieve the best results. If after a course of 4 treatments your symptoms remain the same, it is unlikely that acupuncture will help you. Some people experience lasting relief of symptoms especially when used to manage a recent acute problem. Your physiotherapist will discuss your individual management plan. Acupuncture treatments may vary depending on the condition being treated and how you respond to treatment. Your treatment will be tailor-made to you and your condition. Members of the Acupuncture Association of Chartered Physiotherapists (AACP) are required to train to a minimum standard and are bound by professional codes of conduct through Chartered Society of Physiotherapy (CSP) and Health Professions Council (HPC). Acupuncture is safer than many of the drug treatments used. However, any procedure that involves inserting needles into the body has some potential problems, but these remain minimal and will be discussed with you. An increasing number of research studies show massage reduces heart rate, relaxes muscles, improves range motion and increases endorphins (enhancing medical treatment). It is also beneficial in releasing stress, anxiety and promotes relaxation. Although therapeutic massage does not increase muscle strength, it can stimulate weak inactive muscles and thus partially compensate for the lack of exercise and inactivity reasulting from illness or injury. It can also hasten and lead to a more complete recovery from excercise or injury. Indian Head Massage is based upon ancient Indian aryuvedic techniques and is deeply relaxing and invigorating. It is the ideal treatment for anyone who suffers with tension headaches, stiff and aching shoulders, eyestrain and general stress and anxiety. The Practitioner uses different massage techniques and accupressure points on the back, shoulders, neck, head and face to relieve pain and tension, encourage circulation and oxygen flow to the brain. During a Reiki treatment, the practitioner directs healing universal energy called Qi, to several areas of the body. This helps to activate the natural healing processes of the body and restore physical and emotional well-being. Reiki can relieve pain and acute symptoms quite rapidly while more chronic problems may require more extensive treatment. The aim of hypnotherapy is to assist people in finding meaningful alternatives to their present unsatisfactory ways of thinking, feeling or behaving. Therapy also tends to help client's become more accepting both of themselves and others can be useful in promoting personal development and unlocking inner potential. Hypnotherapy attempts to address the client's subconscious mind while client is in a relaxed state and may utilise a wide range of techniques from storytelling, metaphor or symbolism (judged to be meaningful to the individual client) to the use of direct suggestions for beneficial change. Analytical techniques may be employed in an attempt to uncover problems deemed to lie a client's past or therapy may concentrate more on a client's current life and presenting problems. Hypnotherapy is generally considered to be a fairly short-term approach in which beneficial change, if it is to occur, should become apparent within a relatively few sessions. Who may benefit from hypnotherapy? Problems which may be amenable to hypnotherapy include: stress, anxiety, panic phobias, unwanted habits and addictions (e.g. smoking, overeating, alcoholism), disrupted sleep patterns, lack of confidence and low self-esteem, fear of examinations and public speaking, allergies and skin disorders, migraine and irritable bowel syndrome (IBS). People are sometimes concerned that they will 'lose control' in hypnosis. However, regardless of how deeply people may go in hypnosis and however passive they may appear to be, they actually remain in full control of the situation. They are fully able to talk if they wish to (or not, as the case may be). Neither can a hypnotised person be made to do anything against their usual ethical or moral judgement or religious belief. Podiatrists diagnose and treat abnormalities of the lower limb. They give professional advice on the prevention of foot problems and the proper care of the foot. Patients will be of all ages from infants to the elderly. A chiropodist is a medical professional who specialises in the diagnosis and treatment of foot disorders. Reflexology is an ancient practice which involves stimulating pressure points in the feet, hands and ears. Areas of the extremities are divided into reflex zones, each having a different connection to systems within the body. By focusing pressure on these areas it is possible to affect conditions within the body and re-balance your body's energy.